Dr. Loughlin was just fifteen years old when he decided he wanted to be a doctor. He enrolled in a rigorous pre-medical program at Stonehill College in Northeastern, MA, with the goal of entering medical school upon graduation. He received a Bachelor of Science Degree in Biology. At that time, his brother’s girlfriend began receiving chiropractic care. She was very excited about her treatment and talked about how good she was feeling. Dr. Loughlin attended a spinal care lecture given by her chiropractor in his office and became a patient. He also began to experience the benefits of chiropractic care. 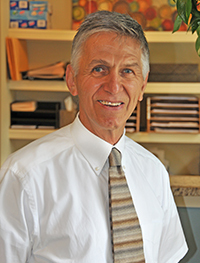 This chiropractor inspired him to enroll at Palmer College of Chiropractic. Upon entering Palmer College of Chiropractic in Davenport, Iowa in 1976 he was completely amazed at what was the wonderment of Palmer College– “the fountainhead of all things chiropractic”. Learning about the history of chiropractic from its simple beginnings in the office of D.D. Palmer to the development of chiropractic under the direction of his son B.J. Palmer inspired Dr. Loughlin. Famous epigrams of Dr. B.J. Palmer were printed on the buildings throughout the campus. His favorite was “Early to Bed, Early to Rise, Work like Hell and Advertise.” After only a few months of study, he realized he had made the right decision to become a chiropractor. Dr. Loughlin’s years in Iowa were not without hardship; financial difficulties were always with him. Unfortunately, he had to leave school for eight months to come back to Massachusetts to work and save money for tuition payments. However, these difficult times as a student only increased his resolve to become a doctor of chiropractic and make a success of himself. Dr. Loughlin met his wife when they were in the eighth grade in Northborough, MA. They dated throughout high school and college and separated while he was attending Palmer College of Chiropractic. When he graduated and returned to Massachusetts, they were married and in a period of several years had three children. Dr. Loughlin’s wife has been a steady partner and confidant in starting their practice and has worked in numerous capacities over the last 30 plus years. Currently their adult children are working in various fields. Their oldest son Jesse, is a real estate broker and their son Joseph has been an enormous help to the practice with medical transcription and report writing. Their daughter Jenna has recently started her career as an optometrist. Dr. Loughlin currently receives chiropractic treatments bi-monthly and more often as needed. He considers being a doctor of chiropractic a physical endeavor and strives to keep his body in top physical condition to enable him to deliver chiropractic care to the best of his ability. He is physically active throughout the year skiing, playing golf and frequenting a gym when he can use exercise machines, free weights and the stationary cycle. Thank you for visiting our website. I am pleased that you are interested in safe, effective, natural chiropractic care. I hope that I get the opportunity to meet you in person to discuss your specific health concerns. Call our office or email me to arrange a consultation.